This Octane toy hauler allows you to take your adventures to the next level. 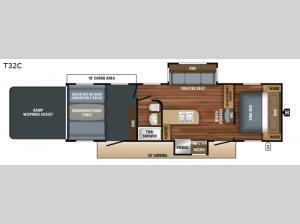 Because of the two slides in this trailer, you have plenty of room for the 8 cubic foot double-door refrigerator in the kitchen and the theater seating in the living room. The front private bedroom with the Jayco-exclusive Simmons king-size bed gives you the home-like comforts to which you are accustomed, and the bathroom skylight brings in an extra bit of sunshine every morning to help you begin your day. Jayco has designed the Octane toy hauler with the avid adventurer in mind because they have included everything needed for a successful trip to the outdoors. The large cargo area allows you to bring along any of your favorite sporting goods, such as a kayak, bicycle, or even an ATV, and the MORryde CRE3000 suspension system, as well as the integrated A-frame, gives the Octane a sturdy and reliable base for transporting your cargo. The Octane features an outdoor shower so that you can leave nature where it belongs and prevent bringing it inside with you, and the electric awning with LED lights gives you a place to enjoy the fresh air while protected from the elements.